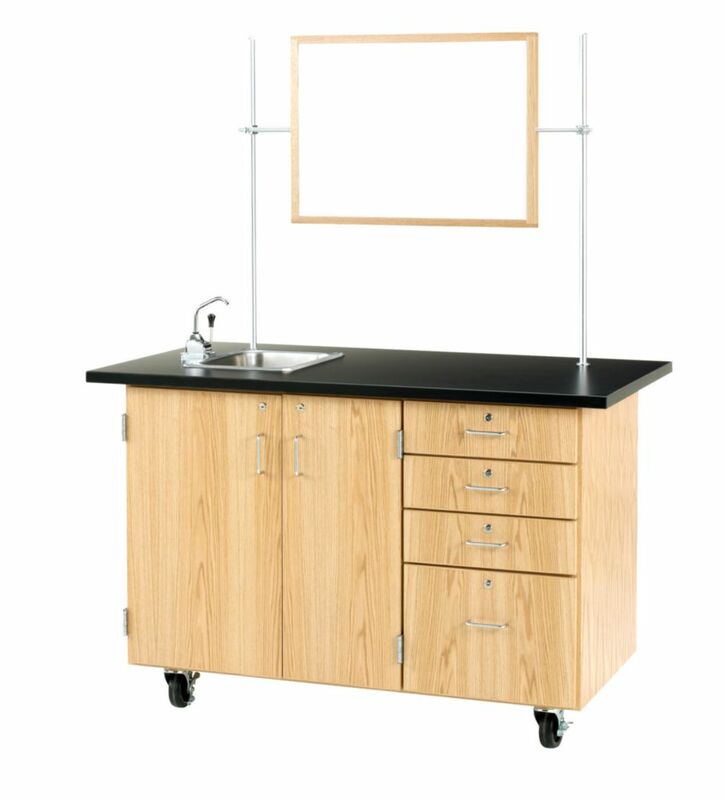 This completely self-contained demonstration center is designed to provide a greater work area, as well as additional storage space. It is constructed of first quality solid oak, and oak and hardwood veneers, and its natural transparent finish is durable and highlights the beauty of real wood. It features one file drawer with full extension glides, three smaller drawers, and two cupboard spaces all with locks and wire pulls. All of the drawers will open smoothly because they are on epoxy-coated steel glides with nylon rollers. The demonstration center itself will also roll easily on 4" ballbearing swivel casters with brakes. It comes with a stainless steel sink that measures 15"L x 13"W x 5"D, a hand water pump, two 2-gallon water bottles and connecting hose, two rod sockets, two 3/4" diameter x 36"L upright anodized aluminum rods, and one 1/2" diameter anodized aluminum crossbar with connecting clamps. A handy removable wooden storage tote tray and a pegboard with hooks is also included, as well as an oak framed combination mirror/markerboard that features a shatter-proof plastic mirror. 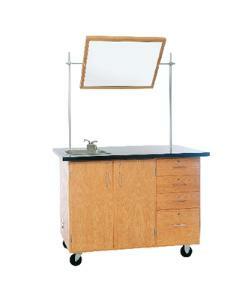 In addition, the combination mirror/markerboard can be conveniently stored in one of the cupboard spaces. You will also have access to electrical service via a 25' extension cord that can be connected to a GFI AC duplex receptacle installed in the side of the cabinet. The top is black 1 1/4" chemical resistant laminate. The cupboards measure 11 3/4"W x 28"H x 20 5/8"D. The file drawer is 15 7/16"W x 20 1/16"D x 17"H, while the small drawers measure only 3"H. Overall size: 30"D x 54"W x 36"H; weight 290 lbs. The unit is customizable. Please call to specify your choice of work surfaces, fittings, fixtures, door, and drawer configurations.